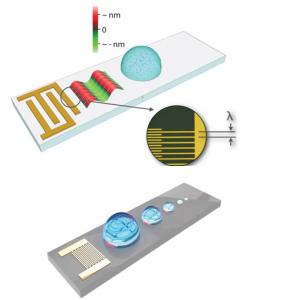 A fundamental limitation within the field of digital microfluidics is the minimum droplet volume that can be internally-controlled and exploited. Surface acoustic waves (SAWs) have been shown to be a fast and efficient method for generating internal flows and patterning in microfluidic droplets, but no improvements in droplet miniaturization have been reported since its introduction. Recently NEST researchers demonstrated the relevant length scales in sub-nanometer amplitude SAW-driven acoustic streaming. We illustrated the absence of any physical limitations beyond fabrication capabilities preventing the downscaling of SAW-driven internal streaming to nanoliter reactors and beyond, and we experimentally demonstrated this by extending SAW microfluidics up to operating frequencies in the ultra-high-frequency range. This scaling was applied to demonstrate ultrafast fluid mixing in nanoliter-order droplets, reducing the working volume of about two orders of magnitude with respect to the previous state-of-the-art. The paper has been published on the scientific journal Advanced Material (link: http://onlinelibrary.wiley.com/doi/10.1002/adma.201400091/abstract).